Nurse Jamie has teamed up with Dr. Daniel Yamini to offer the latest and most effective Medical Spa services at prices you don’t have to be a celebrity to afford. At Beauty Park Spa, our vision is simple: to offer not only the best non-surgical beauty solutions available on the market, but also a customized combination of the most cutting-edge technical advances in anti-aging, skincare and beauty today. Our range of medical spa services includes skin perfecting, injectables, sculpting, slimming, shaping and circumference reducing protocols, tightening techniques, laser hair removal, and liquid face lifts, not to mention a wide range of other cosmetic laser and facial services. Our approach is Complexion Couture; a uniquely curated range of services and protocols (on each visit) that are designed to work in tandem to produce the best results for your specific skin and body concerns. Our professional team is always ready to answer all of your skincare questions, analyze your condition and help decide what’s best for you in the realm of beauty. Here at the spa, Nurse Jamie and her team of experts can truly transform your skin and help you to achieve a more youthful appearance for the long term, with results seen in just one visit! Nurse Jamie’s renowned, trademarked techniques and specialty needles can subtly sculpt and lift, taking years off your face and achieving a natural, fresh, well-rested look with dermal fillers such as Radiesse®, Restylane®, Juvederm®, Perlane® or Belotero Balance® and paralytics such as Dysport® or Botox®. Our clinic also offers the largest variety of skin perfecting laser treatments yielding dramatic results that can resurface and rejuvenate the skin with less downtime than ever before. Our range of lasers extend to the latest innovations in acne treatments that can eliminate active bacteria and reduce the signs of acne scars, reduce or eliminate laxity, discoloration or texture issues with an arsenal of ablative and non-ablative light, heat, ultrasound, radio frequency and ultrasonic options. We always have the latest technology to tone, tighten and support skin structure for even the hardest to treat areas from knees, ankles and elbows to smoothing and slimming flanks and thighs creating a slimmer, younger silhouette. In addition, our vitamin infusion facials help support skin health from the inside out. Our Detox and Slim Wraps use infrared thermal energy most similar to the energy produced during exercise causing the body to naturally release and eliminate fat and toxins. Losing inches and getting rid of filthy toxins has never been easier. We work to penetrate below the skin’s surface for the greatest changes at the cellular level, yielding optimal outcomes. We will help you to delay the signs of aging, push back the “drooping point”, reach your beauty goals and maintain complexion perfection so you can put your best body and most fabulous face forward. 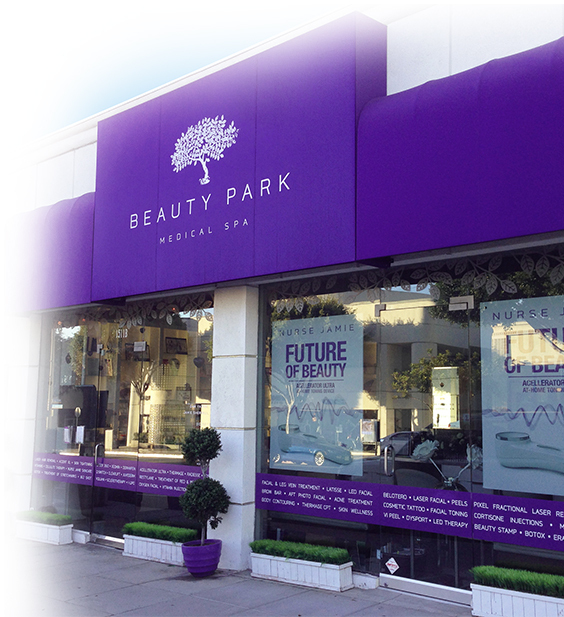 Beauty Park is located on the chic and trendy Montana Avenue at: 1511 Montana Avenue, Santa Monica, CA 90403. Come visit us to see how our non-surgical treatments can take years off your face and body and our pain free-lasers make permanent hair removal a dream!